Two of our pilots, Cameron Witzler and Michael Payne, traveled across the middle of America to capture line of sight data for a client last week. They accomplished this 1,749 mile journey in just 3 days. 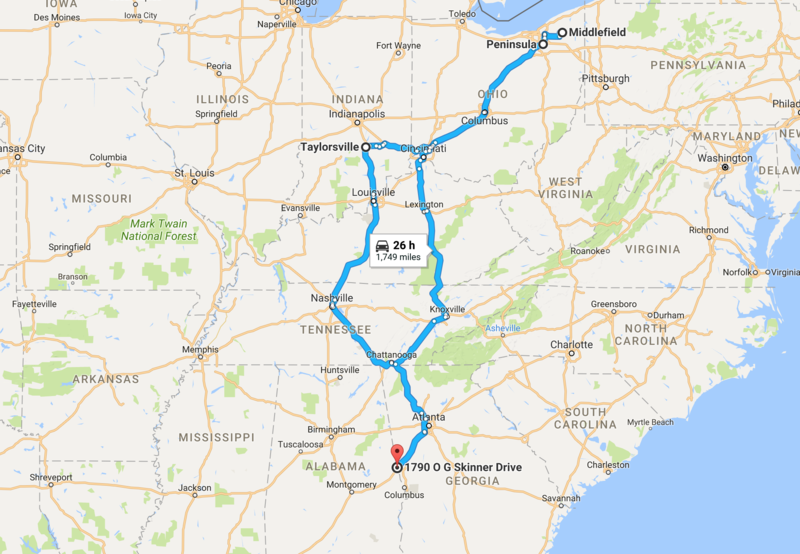 They started the journey from our headquarters in West Point, GA and made their way to the first stop in Taylorsville, IN followed by, Peninsula, OH and finally Middlefield OH. Their work day began at sunrise and ended their flights when the sun set. Our pilots are some of the hardest workers in the industry and are always ready for any project at a moments notice. We are committed to using innovative technologies to provide safer, faster, and more accurate data capture than ever before. Our use of unmanned aerial systems (UAS) for the collection of valuable information is revolutionizing the way critical infrastructure industries manage their assets. The DJI S1000, DJI Matrice 600, DJI Inspire 1 Pro, and the Aeryon Skyranger are just a few of the drones we use to ensure the highest quality data capture. Talon’s drone services reach a variety of critical infrastructure industries, and we have applications to significantly increase production and revenue for your business. To learn more about our pilots, visit our about us page.